Norwegian Breakaway, the largest ship ever constructed in Germany, was floated out of MEYER WERFT’s covered building dock II this morning in Papenburg, Germany where the 146,600-ton ship has been under construction since September 2011. Beginning at approximately 7 am (Germany time), the massive 4,000 passenger ship with her signature hull artwork designed by pop icon Peter Max, departed building dock II as the first ship to depart bow first. 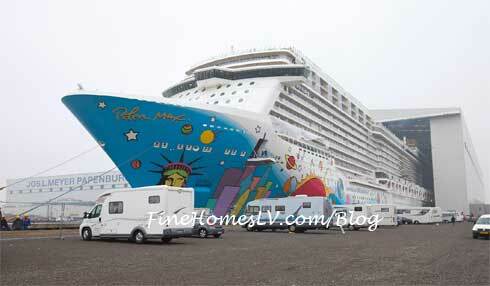 Norwegian Breakaway has an overall length of 324 meters, and is 39.70 meters wide. The ship’s float out represents a major milestone in the vessel’s construction as it denotes that the ship has now moved into the final phase of construction with delivery taking place in just 58 days. “This new vessel is a further milestone for us. Its construction complies with the latest safety standards, and the ship meets all valid environmental regulations. Beyond that Norwegian Breakaway includes a lot of unique design elements and technical innovations,” said Bernard Meyer, Managing Partner of MEYER WERFT. Following the float out, tests were carried out in the harbor and the ship was berthed alongside the yard’s outfitting pier. On March 4, the first crew members will move into their staterooms on board, and begin to familiarize themselves with the ship, readying her for guests. Norwegian Breakaway’s conveyance down the river Ems towards the North Sea, where she will prove her seaworthiness, is scheduled for March 10 (weather permitting). Designed as New York’s ship, Norwegian Breakaway will bring the best of NYC to sea when she arrives to her year-round homeport in early May 2013, offering the high-caliber dining and entertainment options that New York is known for worldwide. To date, the company has revealed the ship’s groundbreaking design, including an open-air boardwalk, The Waterfront, and 678 Ocean Place; a wide range of indoor and outdoor venues on three dynamic decks that will create a whole new complex at sea that enhances guests’ connection with the ocean. Norwegian Breakaway’s entertainment will include three Broadway shows: five-time Tony nominated ROCK OF AGES; the dance sensation BURN THE FLOOR; and CIRQUE DREAMS & DINNER JUNGLE FANTASY. The famed comedy troupe The Second City, Howl at the Moon dueling pianos, and New York’s own Slam Allen will perform on the vessel. Norwegian Breakaway will also feature an exciting fireworks show on every cruise that will dazzle guests on the second to last night at sea each week, and will be the grand finale of a decadent 1980s-themed deck party. Food Network star and celebrity chef Geoffrey Zakarian will also debut his first restaurant at sea on Norwegian Breakaway: Ocean Blue by Geoffrey Zakarian. Buddy Valastro, star of the TLC series “Cake Boss,” will open an extension of his popular bakery, Carlo’s Bake Shop. The ship will feature a total of 28 dining options on board and an Ice Bar, which will be kept at 17 degrees Fahrenheit and feature New York City-inspired specialty cocktails, as well as ice sculptures of the Brooklyn Bridge, Statue of Liberty and the Chrysler Building to pay homage to New York City.